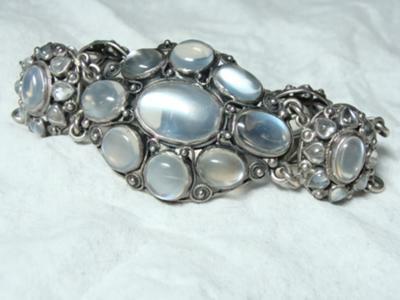 About twenty years ago I stumbled across this antique moonstone bracelet. I had become interested in antique and vintage jewelry but knew nothing about it. This piece started my love of antique moonstone pieces. Since opening my White Peacock Jewels shop on Ruby Lane I have crossed paths with many more moonstone lovers. It is easy to see why it is so alluring. Hi Nadine, we love antique moonstone jewelry too. You may wish to consider advertising one of your pieces with us on Jewel of the Month with a direct link from the Jewel-of-the-Month back to your shop.